Beyond $15 million is where an account ceases to be “merely” that of a wealthy individual but belongs to a well-endowed family legacy. Most families keep their money managers in-house and under wraps, but one local money management firm has built its business model around serving wealthy families in Texas and Oklahoma. Chuck Fuller and Brian Carney formed a partnership in 2004 with local investors Sherman Smith and John Brock upon leaving their jobs managing portfolios at Bank of Oklahoma. The result was Bridgewater Investment Management, now Bridgecreek Investment Management LLC, headquartered in Tulsa at 2431 E. 61st St., Ste. 315. Fuller started his career in money management with Merrill Lynch Asset Management in Dallas while Carney made his start at JPMorgan Private Bank, also in the Big D. While at the Bank of Oklahoma, Fuller and Carney were members of the asset allocation and stock selection committees and managed more than $1 billion in assets. Fuller and Carney took several clients from the bank to start a “reasonable” asset base, “and that just sort of took off,” Carney said. “Returns have been really strong,” and though specific numbers were not available for print, the rates of return have significantly outpaced the market. Since the firm’s inception, Fuller and Carney have brought about 60 families to Bridgecreek, which totals $360 million in assets under management. 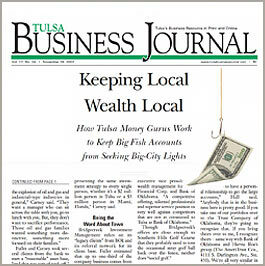 Before Bridgecreek Investment Management, Fuller and Carney said many Tulsa families couldn’t justify keeping their accounts with local firms when Dallas and New York came calling not only with tickets to the theater and limo rides, but also with a slew of investment options tailored for the ultra-wealthy. “I think that gives you a competitive advantage when you go in against the Wall Street firms, and they’re looking sort of cookie cutter and everyone’s got the same portfolio, they’re going after the same people and they’re not specialized. They’re basically presenting the same investment strategy to every single person, whether it’s a $2 million person in Tulsa or a $5 million person in Miami, Florida,” Carney said.